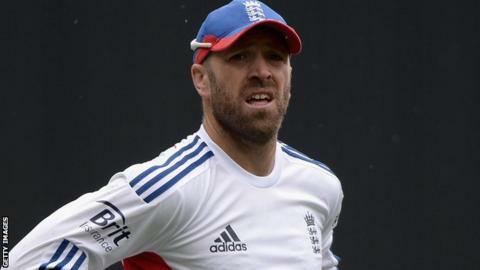 England wicketkeeper/batsman Matt Prior has signed a two-year extension to his contract with Sussex. The 32-year-old, who made his first-class debut for the club in 2001, will remain at Hove until the end of 2015. Prior has won 75 Test caps since making his England Test debut in 2007 against the West Indies but lost his place in Australia over the winter. "I am very much looking forward to helping Sussex compete for trophies again this season," he said. The former Brighton College student has scored almost 13,000 first-class runs during his career, over 7,500 of them in 144 appearances for Sussex, including 18 centuries. Prior made 60 consecutive Test appearances for England, but was dropped ahead of the fourth Ashes Test in December in favour of Yorkshire's Jonny Bairstow. However, who should keep wicket in this summer's Tests is one of the main discussion points for the selectors, and the Johannesburg-born gloveman begins the new season hoping that strong county performances will help him regain his place in the national side. "Hove is a very special place to me," Prior added. "I hope to be a part of future success, something I know that everyone connected with the club works very hard for."